Note: This topic applies to the Hearst Release. Reports and alerts are distributed according to the Smoothwall’s output settings. In order to send reports and alerts, the Smoothwall must be configured to operate with mail servers and email-to-SMS gateway systems. The Smoothwall generates SMS alerts by sending emails to a designated email-to-SMS gateway. When an email-to-SMS gateway receives an email, it extracts the information it needs and composes an SMS message which is then sent. A wide variety of different email-to-SMS gateway services are available. However, each has its own definition of the format that an email should arrive in. While there are a few conventions, typically the destination SMS number is placed in the email's subject line. It is necessary to configure the Smoothwall so that it can format email messages in the format specified by your email-to-SMS gateway service provider. The content of the alert message. The hostname of the Smoothwall (useful when using multiple firewall systems). The description of the Smoothwall (useful when using multiple firewall systems). A special placeholder that indicates that all text following it should be truncated to 160 characters. This requires truncation to be enabled (indicated by the Truncate SMS messages to 160 characters option). Some email-to-SMS gateways cannot process messages whose content is longer then 160 characters. The Smoothwall can be configured to truncate messages – in this mode, all characters past position 155 are removed and the text: .. + is appended to the message to indicate that truncation has occurred. A further complication is caused by email-to-SMS gateways that require parameters such as usernames and passwords to be set within the email's message body. In situations where truncation is enabled, such additional (yet required) parameter text may force truncation of the actual alert. To compensate for this, insert the special %%--%% placeholder at the start of the actual message content, so that any truncation is only applied to the actual alert content. 1. Go to Reports > Settings > Output settings. • SMTP server — Enter the hostname, or IP address of the SMTP server to be used by the Smoothwall. • Sender’s email address — Enter the sender's email address. Typically be a valid email address reserved and frequently checked for IT administration purposes. This might also be an email address that is registered with your email-to-SMS gateway provider. • SMS to address — Specify the formatting of the email's To: address according to the format required by your service provider. This may be a regular email address, or it may require additional placeholders, such as, %%SMS%% to identify the destination of the SMS. • Truncate SMS messages to 160 characters — Select if you want the contents of the SMS message body to be truncated to 160 characters, or if your email-to-SMS gateway service provider instructs you to do so. • Enable SMTP auth — Select to use SMTP auth if required. • Username — If using SMTP auth, enter the username. • Password — If using SMTP auth, enter the password. • SMS subject line — Enter the subject line of the SMS email as specified by your email-to-SMS service provider. This will often contain the %%SMS%% placeholder, as many email-to-SMS gateways use the subject line for this purpose. • SMS message body — Enter additional placeholders and the content of the alert message. If the truncation is required from a particular point onwards, use the %%--%% placeholder to indicate its start position. For a detailed description of how to use placeholders, and truncating messages, see About Placeholder Tags and About Truncating Messages. 1. In the Send test to field, enter the cell phone number of the person who is to receive the test. Typically be a valid email address reserved and frequently checked for IT administration purposes. This might also be an email address that is registered with your email gateway provider. 1. 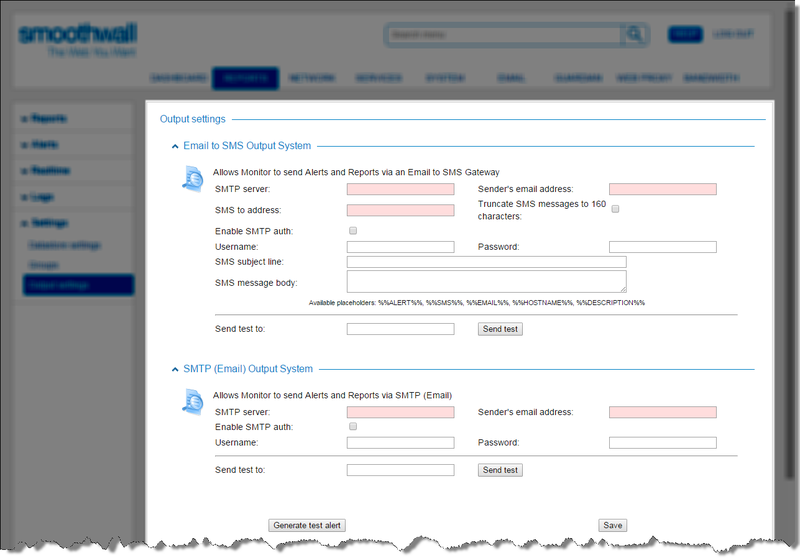 Configure Email to SMS output, or SMTP (Email) output, or both. 2. Click Generate test alert.